College Green is the newest of our public open spaces . While it was originally created under the ‘Clean and Green’ banner in 1982 there was a major upgrading in the council’s 2006 Parks Strategy. This removed some overgrown areas which gave cover for local anti-social behaviour. Our Friends group had a significant input into the improvements in this green space. This was designed by Christine Cranfield, a long time council staff member. Sadly Christine died in July 2008 after a long illness. This area remains a marvellous tribute to her creative talents. The green is located at the junction of West Street/North Street/College Road; adjacent to the County Court and the rear of Bromley’s most historic and important building, the Grade I listed Bromley College and is an important part of the setting of that building. Originally it was ecclesiastical land belonging to the College and leased out as a nursery and market garden. College Slip which links the green to the High Street is of medieval origin and offers fine views into the College grounds. The old ‘Seedsman’s Cottage’ in College Slip dates back to the mid 18th century and was home to a succession of nurserymen from that date right up to 1982 when the council finally demolished the currently existing greenhouses and ended the historic use of the land. Up until then It was known to be the second oldest site in Greater London in continuous use for the growing of plants and seeds. The cottage was sold off by the council in 1987 finally severing its link to the field. In the 1 9th century the field was generally known by townsfolk by the name of the seedsman living in the cottage e.g.. Pococks, Stiddolphs, etc. But it was also known as the ‘Mulberry Field’ taking its name from a mulberry tree of uncertain age in the centre of the field. The mulberry tree is still there, fallen down but thriving and bearing fruit each year – a wonderfully historic survivor of old Bromley. This area provides a much needed green space for the inhabitants of Bromley North, as well as passers surrounded as it is with major roads and Victorian terraced houses, with small back gardens at best. Mulberry Tree. As mentioned above this is a survivor of the earlier history of this site. While it is leaning at a angle it is still very much alive and in July produces delicious fruits. You have to be careful as its juice temporarily stains you fingers red! This tree is in fact the Black Mulberry (Morus nigra). The story goes that James I imported these trees into England in mistake for the White Mulberry (Morus alba) whose leaves would feed the pupae of silk moths and thereby establish a new silk industry in this country. True or not it seems that our gain was the silk moths’ loss. Flower bed. 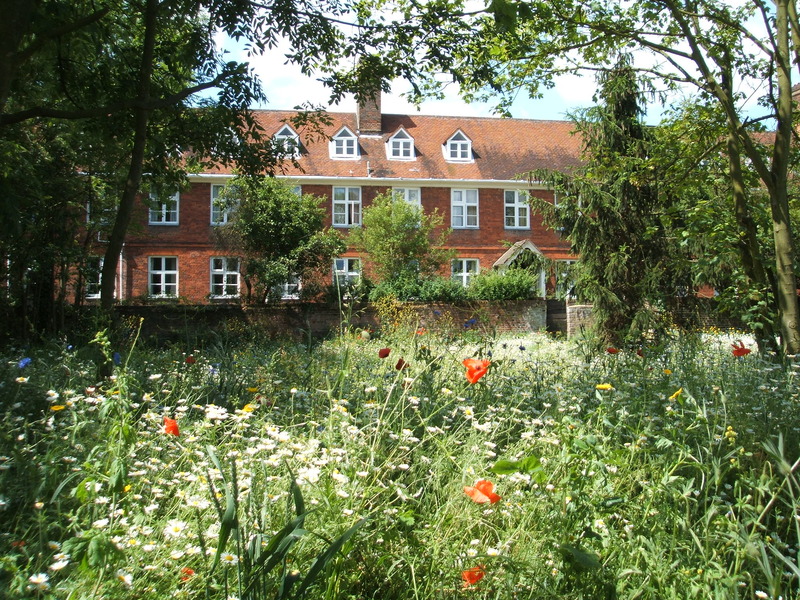 Around the Mulberry Tree is a flower bed planted with flowers and herbs that would have been present in the 17th century, when Bromley College was established. This bed has recently been re-planted and a low metal fence installed (May 2008). This flower bed is maintained by Bromley Green Gym. Flower Meadow. On the site of a former building this area was originally sown with suitable seeds in 2006. This area is mown each September and continues to develop slowly. Since 2013 Bromley Green Gym have been running a volunteer group on this site. Working with the Friends group and Bromley council, BGG volunteers have been enhancing College Green and the adjacent College Slip. They have already begun to make a difference and this has been greatly appreciated by local people. Volunteers are welcome to just turn up at College Green any Friday 11am to 2pm. A great way to exercise and make a real difference to this public green space! Getting involved is simple! Find more information about Bromley Green Gym on Twitter or on Facebook or by email, or call 07542 922468 .